In today’s ever-changing marketplace, staying active on the Internet and on social media can be a game changer for companies and the way they do business. Having a strong website is perhaps one of the most important tools companies can have at their disposal. If you’re starting a small business, a website is a must. With that in mind, here are four ways a website can help your business. Credibility: Think of your business website as an online footprint. This is where clients, customers, associates, and others will be able to find you. Each page of your website should have a purpose. The home page is inviting and lets people see what your business has to offer. The contact and about pages tell visitors about your business and how to contact you. Most importantly, having a website gives your business credibility. It gives a business an online identity and, if nothing else, it proves your company is real. Studies have shown that customers are more likely to trust a business if they have an actual website with social media accounts as compliments. Helping Build Business: With the continued growth of the Internet, websites are not just for information and marketing anymore. Today’s websites are tools businesses use to grow by sharing their stories and values and conducting business online. With today’s ease of Internet access, a website is essential and it’s also important for it to be user-friendly, especially for smartphones. Nearly 80% of today’s American consumers shop on smartphones, so a website with good mobile responsiveness is paramount. When it comes to a company’s website, nearly 50% of users view a lack of mobile responsiveness as a lack of caring on the part of the business. The last thing you want is for visitors to your site to be turned away because your website doesn’t translate well to a smartphone or a tablet or has slow mobile responsiveness. A website development company can help make your website grab the attention of customers. In as little as 10 seconds, customers can form an impression of your site and/or company. If the impression is a bad one, they’ll leave. Visitors to websites love videos and other content in a visual format. In fact, some content videos easily top 50 billion views a month. Users on a site read just over a quarter of the content on a particular page, so it’s important to make the most of your home page to draw visitors in. Standing out: It’s been estimated that more than three billion people are online every single day. 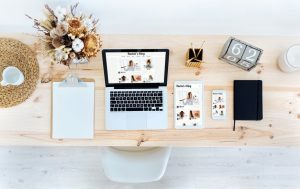 By not having a company website, you’re doing your small business a disservice and missing out on the opportunity to make your business stand out. How can your business stand out online? Develop a website that makes your business easy to find online. Give your small business a platform to distribute content online via social media, blogs, and other platforms. Have good mobile responsiveness to have the ability to conduct business all day, every day. Building Relationships: Whether you’re conducting business in a brick and mortar store or online through a website, you need to establish loyalty. You want customers to be interested in your products and do repeat business. More than 60% of those who are online around the world search for products online. So having a business website can let visitors know just who you are and what your business is all about. As more people visit, you can enable visitors to leave comments and complete surveys to let you know what they like or don’t like about your business and where you can improve going forward. When it comes to your site, the 80-20 rule is a good rule of thumb for keeping your visitors on your site longer: 80% of your site should be relevant to what a customer is looking for. The other 20% should be used to bring folks up to speed on what your business is about. Having an easy-to-use website with a strong social media footprint and good mobile responsiveness will allow companies to reap many online business and social media benefits. A website development company can help a business create the perfect site and help improve a company’s keyword rankings, internet advertising, and web visibility.